“Meaning, a person sins due to the absence of spending and providing on the one spending upon is obligated. Regardless of whether that was due to him not seeking sustenance for them (by working), or if he was wealthy but was stingy and tightfisted with them. Or perhaps he spends and gives optional charity to those who aren’t close to him, neglecting those who it is obligatory for him to spend on, from those close to him, (wife, children etc), so by doing this he fulfils a recommended act but abandons an obligation. 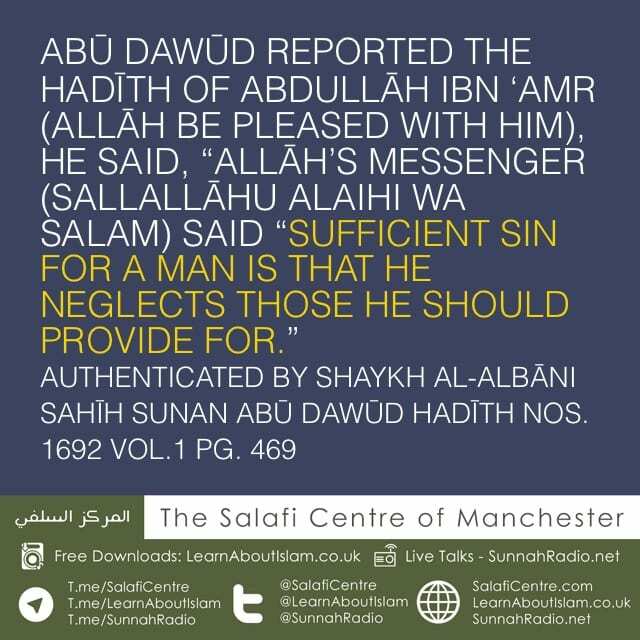 Indeed he is sinful because he abandons that which Allāh (‘azza wa jal) obligated upon him, from spending upon those it is obligated to provide for. Slightly Paraphrased from Shaykh ‘Abdul Muhsin’s (hafidahullāh) explanation of this hadīth in his lessons on Sunan Abū Dawūd in the Prophets Masjid. So Allāh’s Messenger said “Spend it in on yourself”.